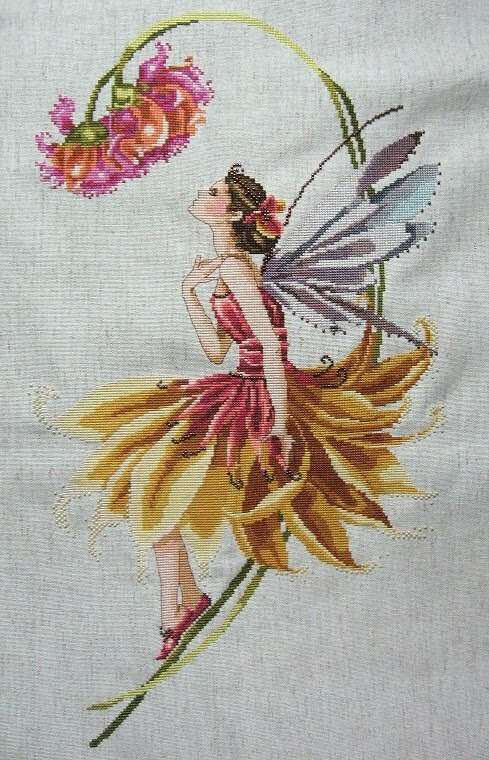 Northern Expressions Needlework: Petal Fairy all done! I finished her up on the weekend and she turned out beautifully. I made a few changes - I substituted Eterna silks for her wings to make them really sparkle, and I decided I didn't like the backstitched lines around her hair and skirt so I omitted them. I also changed the fabric to Oatmeal Floba as I found the natural a bit too dark. I'd estimate in total she took about 3 weeks of stitching to complete. I'll do Bliss Fairy at a later date to go along with her, and then get them framed the same. Mom has claimed them for her living room over the sofa. lol I have her all kitted apart from the silks - don't have the right Eternas on hand. I was going to order them and found that the Eterna shop is down. Does anyone know if they have they closed? I may have to go with Pearsall's or Silk Mill instead if that's the case. I started on Rose on Sunday, but haven't got much to show yet. It's been a nightmare few days. The fridge broke down Sunday (and I've been telling the landlord for ages that it was going). With the high heat and humidity we've had, we lost everything in it. And we can't seem to get hold of the landlord - he seems to be ducking us. Yesterday while in the shower I heard him outside yesterday cutting the hedge so after I got out and dried myself off, I ran out to talk to him about the fridge and he was gone already with the hedge only partly finished. Strange. We ended up having to replace it ourselves and found a second hand one for $100. It's not great, but it works for now. Add to that the hot water tap in the bathroom that is broken, the shower that needs to be fixed (it's currently duct-taped to the wall to hold it in place), the hardwood floors that are so badly in need of refinishing that you run the risk of splinters if you walk barefoot and the rain gutters that are nearly hanging off the house, to say I'm a little pissed would be an understatement. We've offered to do the work ourselves and he can either buy the materials and deduct the labour off the rent, OR we'll buy the materials and deduct both off the rent, but he won't go for it (even though Jon is a bloody carpenter). Yet, he doesn't want us to move out because he knows if we do, he'll HAVE to fix all this stuff before he can rent it again. We're looking for a house to rent now, problem is because this is mostly a "summer rental" town, there isn't a whole lot that is available to rent by the month. Most of it is weekly rentals in the summer so it might take a while to find something. Then yesterday, in the midst of my nervous breakdown about the fridge/landlord situation, my internet crapped out. I called Bell to find out what was going on and they had suspended my service for non-payment. HUH? We paid it. What actually happened was that we cancelled the pre-authorized payment in March because their payment date didn't work with our schedule. We wanted to have it come out the following week and they couldn't change it, so we cancelled it altogether and now make our payments manually the second Tuesday every month. However, it's now July and they're still trying to take it out each month. The bank has a stop payment on it, so it doesn't go through. So even though the account is up to date and there is a balance of $0 owed, they turned it off for non-payment because THEY failed to cancel the pre-authorized payment. AND we have called them EVERY month since March, each time they try to take it, to notify them of their error. After 3 hours on the phone with them, they finally admitted that they made a mistake and switched it back on, but it didn't actually come back on until about noon today. Idiots. I swear, if they try to charge me a reconnection fee, my head will explode. Add to that a collection agency keeps calling me about a debt from 1998. It was nearly paid off in 2003 (I found the last bill I have on hand and the balance was $300) and my ex and I separated at that time. He kept the furniture and said he'd make the last couple of payments. I figured he had since it's now 2011 and I never heard a word about it and I've been at this address since 2004. Apparently he didn't. They insist that they've notified me about this - however the only record I can find is voice mail messages which say something to the effect of "this is Mrs. Johnson calling, please call me back at phone # and quote reference #". Not once did they say the agency name or that it was in regards to an outstanding Leon's account. The first "official" notification I received in writing was in February of this year. I offered to pay the remaining principle on the account to clear it, but I will NOT pay 8 years worth of interest (over $2000) just because they failed to notify me. My address and phone number have been public record and associated with my SIN number for seven years. There is no excuse. I'm guessing it's time to find a lawyer about it because they keep refusing my offer and as far as I know, the statute of limitations on a debt in Ontario is six years which means they waited too long to contact me about it anyway. Hopefully that's correct, because I'm getting sick of the calls. Legally they're allowed to call 3 times per week. They call 3 times per day now. Hoping that my week picks up soon! I love your fairy and am jealous it "only" took about 3 weeks! I know I would have taken a year or more. I'm so sorry for all the bad stuff, you sound like you could use a hug and a "fix it all" fairy! (--) -- that's the best hug I can find right now! And if I knew where a "fix it" fairy was, I'd send her to you right away. Good luck.